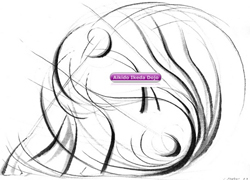 The Aikikai Ireland calendar for 2014 is looking good with plenty of Aikido action. There is plenty of domestic courses already lined up and as always the chance to go abroad and train with our friends overseas. 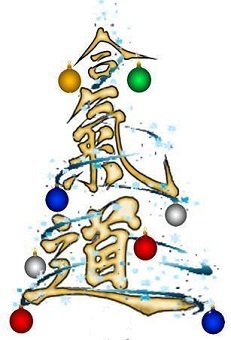 There has been a huge effort put in both on and off the mats to develop our organisation so a huge thanks to all who put the shoulder to the wheel, keep up the great work folks, Look foward to seeing you all in the New Year folks and thanks to all involved who made 2013 such a memorable one for all at Aikikai Ireland!!! On Saturday the 7th of December Aikikai Ireland Technical Committee members Joe McHugh 4th Dan, Eamon Coyne 4th Dan and Trevor Pigott 4th Dan gave a one day seminar in Sligo. At the course eligible students had the oppurtunity to grade. Course picture can be found by clicking here [Course pics...]. Course pics from the recent course in Wicklow with Michele Sensei !!! Pictures now up from the recent Aikikai Ireland Autumn Seminar with Technical Adviser Michele Quaranta Sensei 6th Dan which was hosted by Ikeda Dojo Wicklow.. The pictures were taken by Declan Bray and his able assistant Dean Clancy ;-). Thanks guys for the pictures and thanks again to Michele Sensei for another great course. Technical Adviser Michele Quaranta 6th Dan another great success!!! On October 18th, 19th and 20th Aikikai Ireland Technical Adviser Michele Quaranta Sensei 6th Dan gave a fantastic seminar in Wicklow. The course had a great atmosphere, where once again Michele Sensei's way of teaching captivating all on the mats. Michele Sensei a big thank you once again from all that had the pleasure of training with you the weekend. We look forward to seeing you the next time already ;-).....Course pics to follow soon!!!!. 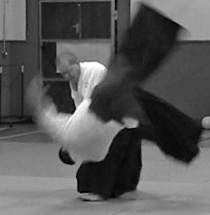 An excellent video with footage of the Aikido colloboration between Michele Quaranta Sensei and Fiordineve Cozzi Sensei held in Lauria, Italy in December of last year. An Aikikai Ireland delegate consisting of Trevor Pigott (Athboy), Tony McHugh (Cavan), Will Baker (Athboy) and Gary Byrne (Athboy) attended the course and had a great time as you can see from the video. For those that can attend, Michele and Fiordineve will have another course together this time in Padova, Italy on the 4th, 5th and 6th of October 2013. By all accounts the gang had a great time training over 5 hours per day with Michele Sensei. Well done folks, great stuff!!!!. 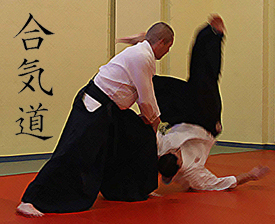 Aikido classes in the Institute of Technology Sligo Aikido club will recommence on Wednesday 25th of September under the instruction of Declan Bray Sensei 3rd Dan. Classes are free for students and staff of the Institute and take place on Wednesday's from 6.00pm to 8.00pm in the Knocknarea Arena. 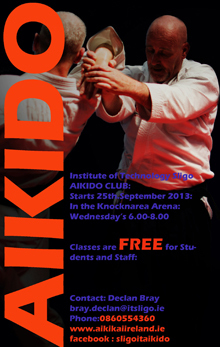 To download the poster in the pciture visit the IT Sligo Aikido dojo homepage by clicking the link below. The 8th summer camp in the Aikido Dojo in Neuchátel took place from Saturday 27th of July through to Friday the 2nd of August. Teaching at the course along with Aikikai Ireland instructor Joe McHugh Sensei were host dojo instructor Eric Graf 4th Dan and also Sander Geloven 3rd Dan of Aikido Dojo in Utrecht.The course consisted of Aikido, Aikiken, Aikijo, Hojo, Genkikai and meditation with plenty of material covered during the course of the week long camp. The course was a great success and Joe throughly enjoyed instructing at it. newly promoted Fiordineve Cozzi Sensei 6th Dan!!! 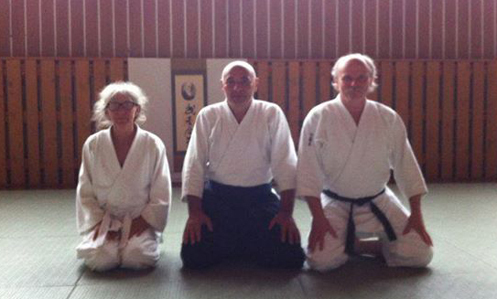 A massive congratulations from all his Aikikai Ireland friends to Fiordineve Cozzi on his promotion to 6th Dan by Tada Sensei on 27th July 2013. 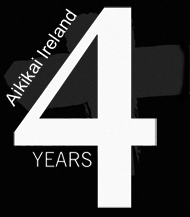 Aikikai Ireland turns the big 4!!! It happened again, we have been that busy we never got chance to mark the 4th anniversary of Aikikai Ireland. It's 4 years since the start of the group on the 2nd June 2009, the 4 years seem to have gone by in a blink of an eye. Over the past 12 months (2nd June 2012 to 2nd June 2013) there has been a lot of hard work done by the group. 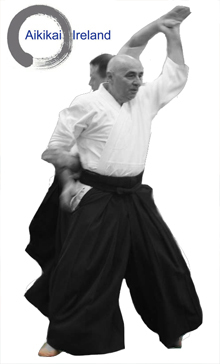 We have had 3 seminars with our Technical Adviser Michele Quaranta Sensei 6th Dan, onein Wicklow (Oct 2012), one in Sligo (Feb 2013) and the very first Aikikai Ireland residential summer camp in Donegal (June 2013) which proved to be a very memorable one for all involved. Thanks to Michele Sensei for it has to be said as always fantastic seminars with a seemingly infinite amount of technical material being passed on. great coverage in both of the Northwests biggest newspapers!!! 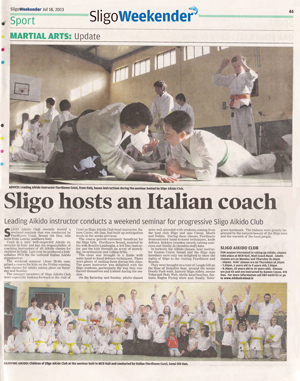 The recent Aikikai Ireland course hosted by Sligo Aikido Club with Fiordineve Cozzi Sensei has gotten great coverage in 2 of the Northwest of Irelands biggest newspapers i.e. The Sligo Weekender (sligoweekender.ie) and The Sligo Champion (sligochampion.ie). Thanks to both Liam Maloney sports editor of the Sligo Weekender and Leo Grey sports editor of the Sligo Champion for the greatly appreciated coverage. Everyone involved at the club were delighted with both articles.To view the articles please click on the link below. As promised the pictures from the recent cross style chairty seminar between Sligo Aikido, Jiu Jitsu and Higashi Karate clubs. Thanks to a good friend © Warren Forde Photography for tons of great pics. Pictured above are Joe Mc Hugh and his wife Lizzy at the recent summer camp in Horni Branna in the Czech Republic with Michele Quaranta Sensei. A great weeks training was enjoyed by Joe and Lizzy. 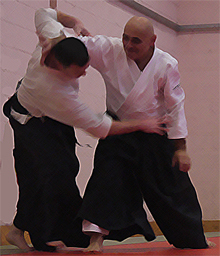 Best Aikikai Ireland Aikido Seminar yet!!! Over the course of the June Bank holiday weekend Aikikai Ireland had a residential Aikido camp with Michele Quaranta Sensei 6th Dan. The course was held over 4 days in the Bluestack Centre in the scenic Bluestack mountains in Donegal. The course was a great success with everyone attending remarking that they enjoyed every second of it, eating, sleeping and training in the one area gives a different feeling to the seminar. Michele Sensei was delighted with the seminar and complimented all particpating on the special atmosphere that was created over the weekend. Thanks to all who attended the course, special mention to our chefs Will and Valli, no easy task cooking for 32+ people, Piotr, Rafeal and Lukas for helping move the mats from Sligo, Tony for the extra mats from his dojo in Cavan, Declan for doing the registration, Timothy for the video camera work, Joe for bringing Michele Sensei up to the course along with Ralph and Charlotte and also the Bluestack Centre staff for having the place immaculately clean and at hand whenever needed. Thanks to all who helped out at the course and put the shoulder to the wheel when needed. Looking forward to the next course already. Check out pictures from the course here courtesy of Declan Bray. 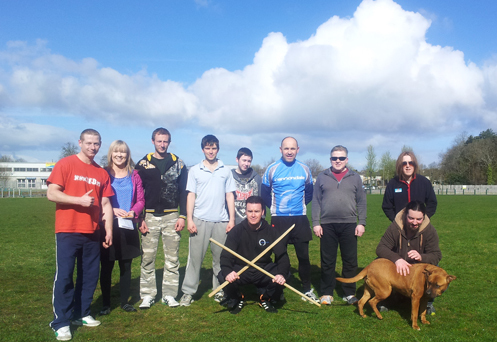 Second Cross style seminar in aid of Foróige a great day had!!! 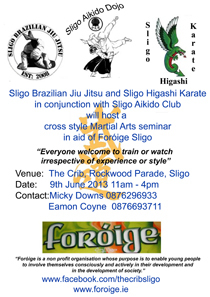 The second cross style charity seminar of the Sligo Jiu Jitsu/Karate/Aikido Martial Artists was held on Sunday the 9th of June in the Crib, Rockwood Parade Sligo. The seminar was in aid of Foróige Sligo. Well done to all of the Jiu Jitsu/Karate gang on nominating a very worthwhile organisation to donate too. The days training was conducted in very hot conditions but it didn't stop the partcipiants in training hard. The first session was taken by Sligo Aikido Dojo instructor Eamon Coyne, the second session was taken by Sligo Bjj instructor Morgan Smyth. Everyone at the course enjoyed the training and we at Sligo Aikido dojo would like to thank Morgan for a great class and also Micky Downs, Ryan Smyth, Francie Mahon and the rest of the gang for the great training and also the great craic socialising. Pictures coming soon courtesy of Warren Forde photography. Watch this space!!! Course in Heron Dojo, a last minute change but a good time had by all!! 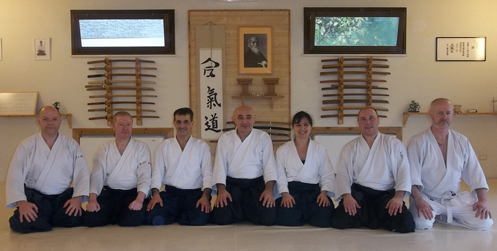 Pictured above are the group for the course with Fiordineve Cozzi Sensei in Heron Dojo last weekend, unfortunately due to health reasons Cozzi Sensei was unable to take the course, much to his regret. At a last minute change Eamon Coyne Sensei, Trevor Pigott Sensei and Tony McHugh Sensei were only to happy to step into the breach and take the seminar at Fiordineve and Fiona's request. It's fair to say, although sad at the loss of Cozzi Sensei everyone in attendance, all of the Italian and Irish Aikidoka in attendance had a great weekend. A big thank you to Fiona and all of the gang for a great weekend. A speedy recovery to Cozzi Sensei we look forward to seeing you in Sligo in June!!. Ballyconnell Aikido Dojo in Cavan open for business!!! Ballyconnell Aikido Club under the instruction of Tony McHugh 3rd Dan Aikikai had a triumphant opening night on Wednesday the 1st of May. The class was well attended with some new faces and some old ones which was great to see. People from both the Athboy and Sligo dojo travelled to attend the class and support Tony on his opening night. Eamon Coyne 4th Dan Sligo and Trevor Pigott 4th Dan Athboy performed a demonstration each for the people in attendance which as very well received, Everyone at Aikikai Ireland would like to wish Tony Sensei and all of the Ballyconnell dojo Aikidoka the very best of luck in the future. Sligo Aikido Club Table Quiz Night another great success!!! 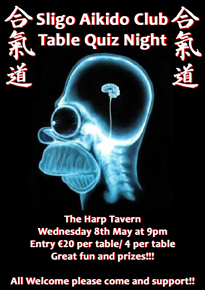 On Wednesday the 8th of May at 9pm the Harp Tavern in Quay Street, Sligo played host to a table quiz night to raise funds for mats for Sligo Aikido Club.The night was a great success with €1120 being raised on the night. Ej Menswear. Catus Jam and Ruby Lane, Marian Harkin MEP, Alfies Barber, DMW Vehicle Repair, Armin Lowe, Tir Na Nog, Jack Jones, Pet Stop in Carraroe Retail Park, Hopes and Dreams Creche, Sligo Rovers FC, Osta Cafe, Swagman, Advantage Communications, The 4 Lanterns, Eamonn McGauran and Son Electrical Limited and the Irish House bar. 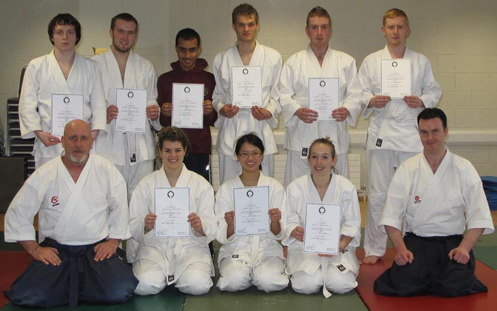 Well done to IT Sligo Students on gradings!!! A big well done to the Institute of Technology Sligo Dojo members that successfully passed their gradings on Wednesday 24th of April. The students who passed were the following The students from the. 5th kyu Darragh Cattigan 6th kyu Tomas Mc Mahan,Fawwaz Al Shammari,Alex Cammertaat,Kevin O Connor,Eanna O Dowd,Francesca Brandola,Sheu Yan Siow,Giuila Barigelli. Well done to Declan Bray Sensei the fruits of his labour was apparent in how well the students performed in the exams. Keep up the good work. Sligo Aikido dojo students outdoor training in preparation for gradings! Pictured avove are some of the Sligo Aikido Dojo students getting some early outdoor training done on Saturday mornings in preparation for the Aikikai Ireland gradings in Wicklow on June 22nd, keep up the good work!! 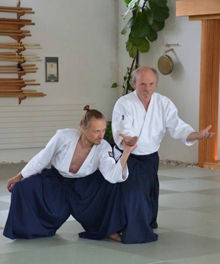 Video of Aikikai Ireland trip to Lauria this time last year!! Below is a video nicely put together by Fiordineve Cozzi Sensei of the Aikikai Ireland visit to Lauria one year ago. It was a tour de force of Aikido, food and wine and great craic. Watch out for a special move by Declan Bray it took him many years to master this, an Olympic gymnast would have been proud!!!! 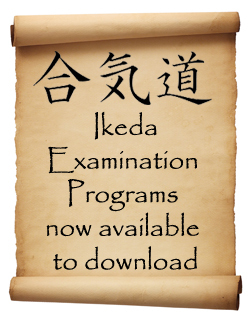 The exam programs from 6th Kyu up to 4th Dan as constructed by Shihan Masatomi Ikeda 7th Dan are now available for download. At class recently a presentation was made by Eamon McGauran on behalf of the Sligo Aikido Dojo gang to Eamon Coyne Sensei to mark the achievement of progressing to 4th Dan. 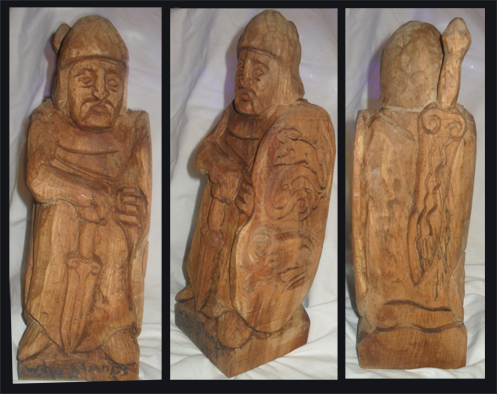 The present was a specially commissioned Warrior piece by renowned Sligo wood carver Michael Quirke. "Thank you very much for the present guys, it ,means a lot"...Eamon. Missing from pic:Paul Cunningham, Paul Burns, Ivan Sullivan, Tony Drumm, Vincent Reynolds, James Harkin, Valli Schafer, Wayne Wallace, Garry Holmes, Carlene Gildea, Glen Blaney, Maria McGuaran, Eamonn Ryan, Karen Webster, Sylvain Marinier. A huge thank you to Michele Quaranta Sensei for a wonderful course in Sligo. Michele Sensei's depth of technical knowledge combined with such a warm and humble personality are always a joy to behold. At the course students had the chance to train Aikido, Aikiken and Aikijo with tons of material demonstrated by Michele Sensei. The course was well attended by all of the Aikikai Ireland dojos and all our other Aikido buddies from around the country. Michele Sensei we are looking forward to the next course in May already. 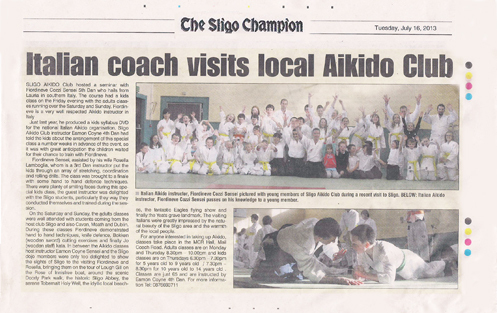 Extra kids class for Sligo Aikido Dojo!!! Extra class now on for Ikeda Dojo Wicklow!! !